Daddy's Blind Ambition: Almost Race Day! I’m not sure how it happened, but we are SIX days away from the Woodrow Wilson Bridge Half Marathon, which hosts the U.S. Association of Blind Athletes championship half marathon. (Note: When I wrote this, we were 10 days away. Sorry for the delay!) Matt has participated in the event several times (winning the division in 2010 and placing second in 2011 and 2012), so he’s very excited to race it again this year. He took a break last fall from racing since our son was only a few weeks old and not sleeping through the night (which means Matt was not sleeping through the night). Now that he’s well-rested and back on track with a more rigorous training plan, he has been logging 40+ miles a week and spending his Wednesday evenings at the track. Last Wednesday he had a solid workout of 12x 400s with 200 meter recoveries and he did it in the rain no less. There will be no Wednesday track workout this week as part of Matt’s taper. Every year the visually impaired field gets more and more competitive at the Woodrow Wilson half, and this year will be no different. Friendly competition is a good thing! In past years the end of the race has been challenging, particularly for those that are visually impaired because of a long stretch of gravel with some large rocks and uneven surfaces. Matt almost lost his footing several times. This year the course map has been adjusted to add in a loop in Old Town Alexandria and to get rid of the challenging gravel. We’re hoping that will mean easier footing and a faster race! This will be Matt’s third race (ever) using a guide. I have talked about it in previous posts, but Matt has benefited from having a guide to not only make sure he doesn’t over shoot a turn, run into someone, or trip on road debris, but to also call out splits and give him some needed motivation at the end of the race. Although he has a system using two watches, one for his overall time, and one for his mile splits, it is still an imperfect process. It is easy for him to miss a mile marker or to not be able to reset his watch in time. Since he has limited vision he is not tethered to anyone so when there is a pack of runners or a hard navigation point, he can also fall behind his guide and let him lead him through a tricky part. For this race, Matt won’t have his usual cheering section since I’ll be 40 or more (hopefully not) minutes behind him on the race course. And with a start time of 7am, our kids will be at home enjoying breakfast and probably an episode of Mickey Mouse’s Clubhouse in their pajamas with Granma while we are out there running. The girls are at an age now when they understand what races are and they love to cheer Matt on. They tell him to run faster and to pick his knees up so they are disappointed they won’t be out there. Hopefully they can come out for a shorter race soon. I’m starting to get nervous for the race. Not sure if it is pre-race jitters because I am running or because Matt is racing. Either way, I’m super excited for the race!! Keep your fingers crossed for great race weather. The 10-day forecast is current predicting a high of 69 and a low of 50 with sun. I’d be happier if it was even cooler and overcast, but the weather can change in six days. Stay tuned! This was Matt cruising into the finish line at the 2012 Wilson Bridge. Must be nice to have the road to yourself. So this was us the last time we ran the same race together. 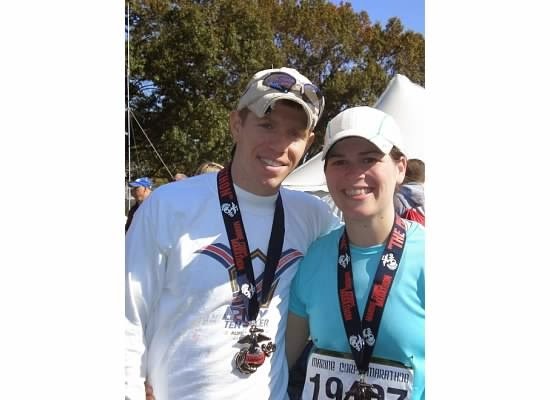 That was the 2008 Marine Corps Marathon. As much as I make fun of Matt for wearing the same shorts in every race, I still wear that same hat.